AMD claims the middle ground once again, but for how long? AMD has returned with another value-driven card that delivers the goods. Whether you're looking to game at 60 fps at 1080p, hook up a 120Hz FreeSync monitor or even dip your toes into 1440p gaming, this card does it all without breaking the bank. 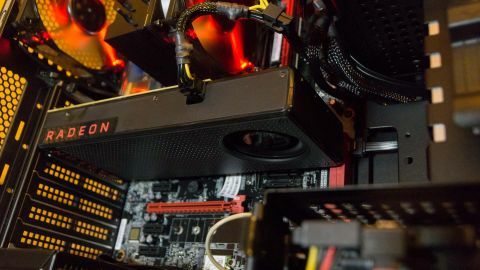 AMD's new Radeon RX 480 graphics card pivots around one goal: bringing high-end gaming and the virtual reality experience to a wider selection of PC enthusiasts and gamers. And with over 40 VR headsets slowly making their way to market - including the HTC Vive and Oculus Rift - we're pretty convinced this card and others like it will play a huge factor in the graphical arms race that's about to ensue. After all, virtual reality will only become a success if games developers and publishers feel confident funding titles that can sell to a wide audience, one that needs to be far greater than VR currently has. Does the RX 480 make that more likely to happen? Well, yes. For now, it's easily over the minimum spec for virtual reality. It performs well at 2,560 x 1440 pixel-resolution and astronomically at 1,920 x 1080, and we may see its pricing fall should Nvidia release its rumored GTX 1060 card. Nvidia manufactures its new Pascal-based GTX 1070 and 1080 cards on a16nm FinFET process, whereas AMD's first sub-22nm offering uses 14nm. That's right - AMD's first offering to the sub-22nm Gods is this, the Radeon 480 8GB edition. Coming in at a neat £215 (or US$240 - around AUS$323), this sweet little number is a cushy £60 (around $81, or AUS$108) less than the mighty, now value-oriented GTX 980. We're bringing that up for one reason: this reference card, with a slight tweak in the overclock settings, outperforms it. So, how do its specs measure up? Well, AMD's Radeon RX 480 comes packed with 2,304 stream processors (think the equivalent of Nvidia's CUDA cores), 36 compute units, 8GB of GDDR5 on a 256-bit bus enabling a minimum of 224 GB/s of bandwidth and a maximum boost clock registering up at 1,266 MHz; before you overclock, of course. All in all it enables around 5.8 TFLOPS of performance, placing the card exactly where we'd expect it. AMD is also selling a 4GB variant of the card at £180 (or $199 - around AUS$325).